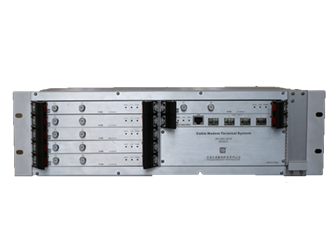 JH-CK6-3416B is a 19 inches, 3U form factor Rack-mountable CMTS from D3-B families. It is designed for Headend access network, dedicated for indoor deployment. It contains 1 Controller board and up to 6 expansion slots for CMC boards. The CMC boards are responsible for handling the DOCSIS 3.0 protocol while the Controller is responsible for CMC management, data forwarding and routing. JH-CK6-3416B allows users to choose the number of CMC boards (Online Insertion and Removal) according to the number of clients. JH-CK6-3416B can provide bandwidth up to 4.8 Gigabit per second with DS (downstream), and 960 Megabit per second with US(upstream), which allows maximum of 3,000 users online simultaneously. JH-CK6-3416B is a highly cost effective CMTS perfect for medium to large access network. With pay as you grow performance, JH- CK6-3416B allows you to increase the bandwidth capacity when needed. By offering dual redundant AC power supply and hot- plugging cooling fans, it minimizes the possible system outage duration. D3-B family is the upgrade version of D3 family, running DOCSIS 3.0 and C-DOCSIS protocol. The D3-B family includes the following forms of CMTS: compact rack-mount type (1U), high-density type(3U), outdoor type and D-node type. With these changes, the D3-B family provides faster forwarding capabilities and larger throughput for IP packet (especially smaller size packet or fragment packet are optimized). All D3-B family products implement CMTS channel bonding technology, providing up to 16 QAM channels with total 1Gbps for DS (downstream), and up to 4 QPSK/QAM channels with total 160 Mbps for US (upstream). The DS can be easily configured to run as either data channel or IPQAM channel. It provides both electrical (RJ45) and optical (SFP, 1.25Gbps) connection for data forwarding. D3-B family also implements layer 3 routing function, QoS, DHCP/TFTP servers, and DHCP relay. Users have 2 management methods, including CLI withTelnet and Web interface. ◆ Users can use CLI by login with Telnet (direct connection to the CMTS). ◆ Users can remote login to the CMTS embedded web interface through internet. D3-B family is capable to run with DOCSIS 3.0/2.0 cable modems, set-top boxes (built-in with modems) and eMTA. ◆Fully compactable with DOCSIS 3.0, C-DOCSIS, supports both EURO-DOCSIS and DOCSIS, works with DOCSIS cable modems. ◆Pay as you grow performance, easily expand your bandwidth. ◆For each CMC board, users are free to configure the 16 DS channels bonding together, with 64/256/1024 QAM, with maximum 1.0Gbps @ 1024 QAM. ◆For each CMC board, users are free to configure the 4 US channels bonding together, with QPSK/3～8 orders QAM, with maximum 160Mbps. 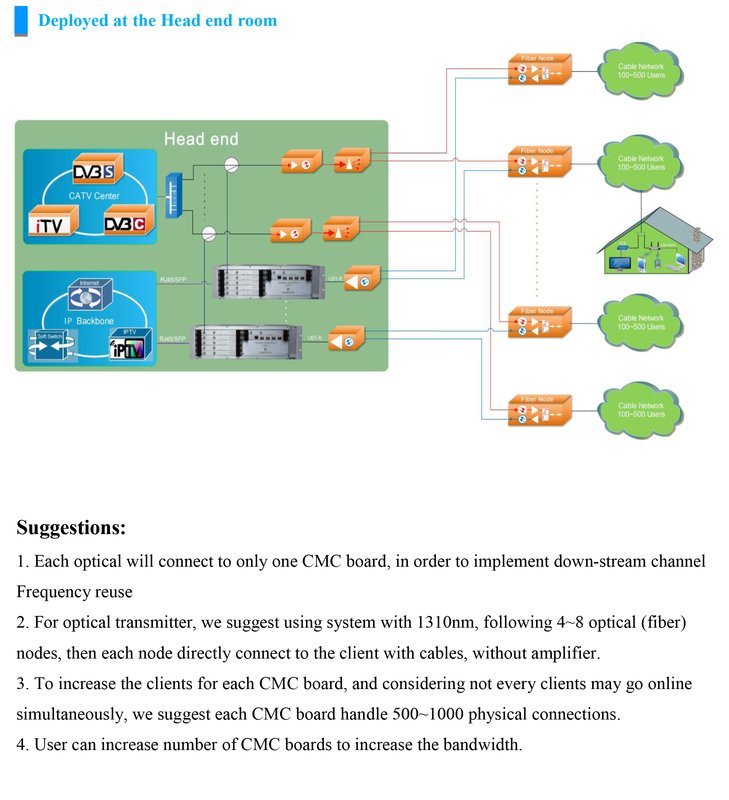 ◆For each CMC board, it supports maximum 500 clients (Cable modem) online simultaneously. ◆Supports layer 3 routing, static route, policy route, VLAN, L2VPN, ACL. ◆Embedded DHCP/TFTP server, supports DHCP relay, CPE subnet arrangement. Support Option 82, Option 60. 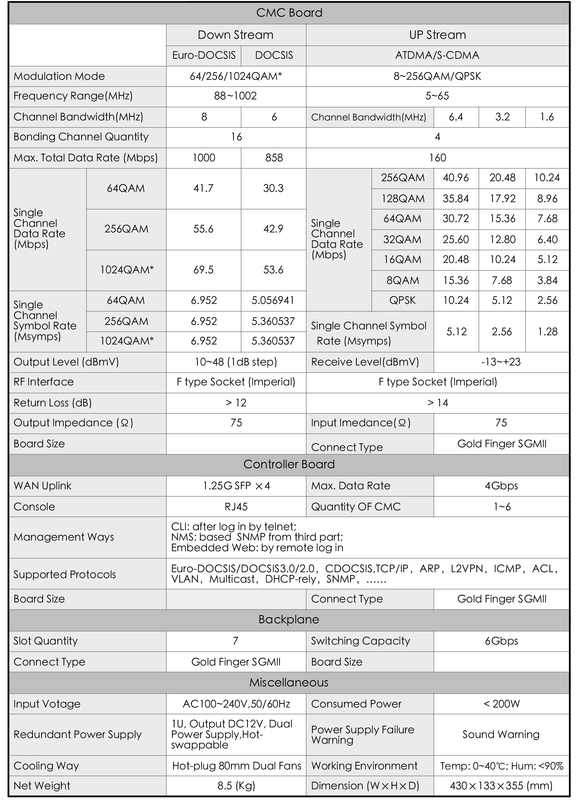 ◆Network interface has 4 x 1.25Gbps optical port (SFP), 1 RJ45 port. ◆Load balancing mechanic for both DS and US, based on the number of clients (static) or data flow (dynamic). ◆Supports IPv6, multicast, remote-query, Flap (DOCSIS signal quality jitter diagnosis), etc. ◆Uses US and DS service flow classifier, QoS based on service flow ensures bandwidth and latency needs for various services. ◆Secures network transmit via BPI+, CM identification, anti-DOS attack, user isolation and IP source checking. ◆Supports US channel spectrum parameter analysis on web management. ◆Two management methods, including CLI with Telnet and Web interface. ◆CMC board Online Insertion and Removal, cooling fan hot-plugin and dual redundant AC power supply, making sure system running 7x24.